A new rule will require truck drivers to log their activities using electronic devices instead of paper forms. The rule was set by the U.S. Department of Transportation to improve enforcement of commercial driving laws, specifically Hours of Service rules. The new rules should help with enforcing the Hours of Service rules set by the Federal Motor Carrier Safety Administration (FMCSA). These limit the amount of time truck and bus drivers can spend on the road. The Hours of Service were created to reduce fatigued driving, a major problem in the trucking industry, where drivers are often pressured to get shipments across the country under tight deadlines. The issue of truck driver fatigue(http://www.edwardslawok.com/truck-driver-fatigue.html) gained national attention when actor Tracy Morgan was seriously injured and put in a coma, along with a writer being killed, after being hit by a Wal-Mart truck in 2014. It was later discovered the driver of the truck had gone 28 hours without sleep. Currently, the FMSCA states that drivers cannot work more than 14 hours per shift. Drivers are permitted to drive 11 hours before taking a 10 hour break. Using paper records, these numbers could be altered to meet requirements, even if they exceeded the allowable limit. Electronic records would make it much more difficult to fake the numbers. Electronic logging devices (ELD’s) are designed to monitor vehicle movements, engine hours and location data. Using this information, roadside law enforcement would be able to check for violations more readily and enforce the law. Protections in the ELD Final Rule are included to protect truck drivers from harassment. However, independent drivers assert the new rule is too rigid. It could force drivers to begin their shifts during perilous weather or peak traffic times. Despite some opposition to the rule, the American Trucking Association believes the rule will improve the trucking industry long term. Technology similar to ELD’s has been available but the trucking industry has debated about cost, who would pay for the ELD’s and whether or not ELD’s invade truckers privacy. 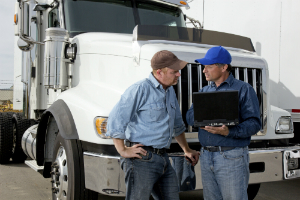 Usage of ELD’s is expected to yield an annual net benefit of approximately $1 billion. Most of the savings is attributed to reduced industry paperwork. Drivers will have two years to make the switch from paper records to ELD’s. ELD’s may also help to build stronger truck accident cases for victims of negligent trucking collisions and improve highway safety. If you have been in an accident with a truck driver who was driving recklessly, we can help you recover compensation. Schedule a free consultation with one of our truck accident lawyers today. The Edwards Law Firm will fight to get you justice.